The penultimate instalment of the Living The Dream blog is now out and continues following the five qualifiers that won their CPT Punta Cana Poker Classic main event seats via Juicy Stakes and Intertops Poker. Two Living The Dream team members made it to the second day of action at the five-star Punta Cana Hard Rock Hotel - perhaps not the two you might think. Here's a hint; partying at the pool seemed to work better than naps, steaks or massages. “Hopefully, I’ll get some better cards today [and] start building that stack up again but I’m still in it,” said qualifier Steven Loney. Loney had done nothing but play poker since he arrived and stayed focused through Day 2 but unfortunately busted near the end of day. 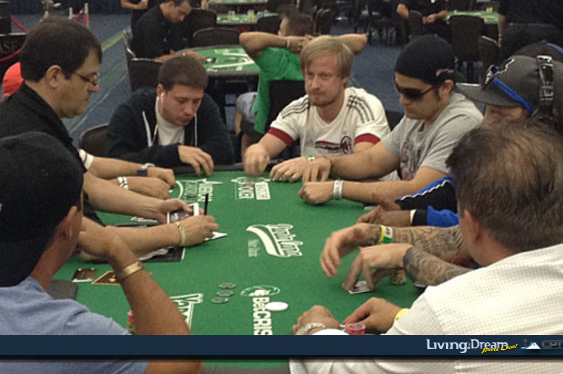 Steven Loney and Daniel Montagnolli make it through to second day of action at Punta Cana Hard Rock Hotel. Two members of the team are professional poker players. Daniel Montagnolli gave up his day job last summer and Derek Scallon has never had a ‘real’ job - his poker career took off before he finished college. Surprisingly, Scallon was out after the first day and Montagnolli almost didn’t make it to the second day. “I started out bad yesterday [and] was down to 2,800 after 15,000 starting,” said Montagnolli. Daniel was in the game until near the end of Day 2 but was free to party after that. All of the five Living The Dream team members won their way to the Caribbean by winning online satellite tournaments at Intertops Poker and Juicy Stakes. Next time: winners of the CPT Punta Cana Poker Classic main event and the $500,000 Punta Cana Classic.